Let ITi streamline your business operation by minimizing back-office trouble and expense. Our approach to data entry and the technologies we employ enable us to deliver the highest levels of data quality, accuracy, and quick turnaround, but also address your need for documentation, data security, and customer confidentiality. Double key verification and field validation are just two examples which Input Technology uses for our data entry services in maintaining quality in your data. We are strictly a non-overseas & no-outsourcing data entry company. All information is kept secure and in the hands of our trained professionals. Feel good about getting the lowest price on data entry services, while knowing your data is secure. Our database management service professionals will assist you to assess your needs and construct a database tailored to your specific requirements. We offer flexible services able to customize to your individual client requirements of RFM values, and can include external demographic, or psychographic information overlay data. We also handle list maintenance for you. We update your database with every response you get. We carefully preserve the strict confidentiality of your valuable data, and protect it with secure, off-site backups. We also offer data hygiene services to keep your data clean and accurate. 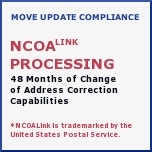 Services like NCOA, CASS, Duplication Elimination, Suppression (do not mail), and Geocoding.